We had the chance to expand our movie collection and enjoy a fun and educational family movie night learning about birds from BrainFood Learning! BrainFood Learning is a company started by parents in order to create educational material for children. They wanted to create material that was entertaining as well as educational. The purpose of the videos is to teach vocabulary words and facts through showing pictures and live video along with vocabulary words and definitions. A curriculum guide with matching games, multiple choice quizzes, and vocabulary word practice to correspond to each video is included on the website. We received The Fascinating World of Birds DVD. This DVD is geared for ages 2-13 and retails for $14.99. The DVD includes information on various types of birds. The DVD begins by listing the common features of all birds. Then the DVD provides information on several different types of birds such as where they live, what they eat, and distinguishing features about that type of bird. Each section begins with facts about that bird and a still picture. Live footage of the bird is also included. There is also a vocabulary word associated with that type bird that is defined at the end of the segment. Review Your Birds – This section has still pictures of each bird and time is given to name them before the name of the bird is said. Features of a Bird – This section details the features of birds that are common to all birds such as hard-shelled eggs, feathers, and hollow bones. Information is included about each topic. Review Bird Facts – This section has review questions with multiple choice answers. Questions include: “Which bird drills holes in trees to find food or build nests?” Three answer choices are given and the correct answer is shown with a picture of that bird. Review the Big Words – This section is also a multiple choice section that provides a definition of the vocabulary words. Then then vocabulary word answer choices are listed with the correct answer being shown after a few moments. The company has also produced other DVD’s in this series: mammals and insects.. Nothing! We found this DVD to be an excellent resource. My kids were excited that the DVD not only had images of the birds, but had live footage of each bird. They enjoyed watching the ostrich run through the grass, seeing the penguin dive and swim, and hearing the sounds made by the macaw. Curly enjoyed hearing the vocabulary words and hearing the definitions. After watching the DVD several times, she was using her new vocabulary words as she talked about the various birds. The facts are interesting and varied. There were quite a few facts that I did not know about birds. I learned new things along with my kids! The review section is wonderful! My kids loved trying to guess which bird was shown in the picture and enjoyed hearing the common features of birds listed again. Curly liked the challenge of trying to choose the correct vocabulary word to match the definition. I found the review section really cemented the facts that were presented in the videos. All of my children, from Ladybug (age 2) to Curly (age 7) enjoyed watching this video. Ladybug and Bee loved the fun music and live footage of each bird. Tiger enjoyed the review section and trying to guess the bird that was pictured. And Curly learned new information about each bird and remembered the vocabulary words. I found this DVD to be an excellent resource and full of information that is presented in a fun and engaging way. We can’t wait to watch it again as we study ornithology this upcoming year. And Tiger has already asked for the insect DVD so I think we’ll be adding some new DVD’s to our collection soon! 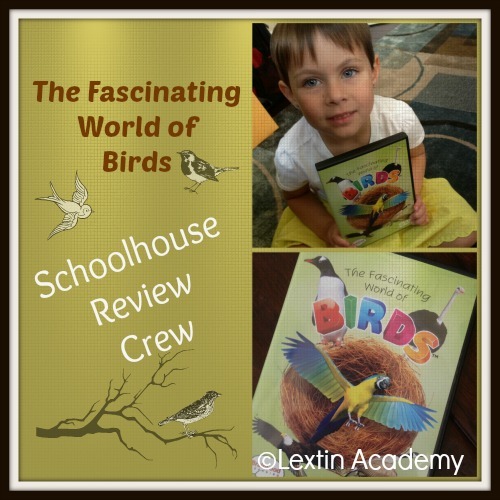 Read other reviews from the Schoolhouse Review Crew here!